In this service, near real-time information about geomagnetic disturbances which primarily affect directional drilling and aeromagnetic surveys, and ionospheric disturbances which primarily affect GNSS-based activities is unified. Resource exploitation activities that can be sensitive to space weather effects include offshore drilling and surveying activities. In more general terms, any resource exploitation activity depending on accurate recordings of Earth's magnetic field and some position in the air or on the Earth surface will at times experience challenges related to space weather. This service is implemented through a combination of products, tools and alerts which can be found through the following tabs along with expert support provided by the teams constituting the SWE Network. Should you require further guidance in the use of this service, or have specific questions about any aspects of the service presented here, don't hesitate to contact the Helpdesk. Directional drilling means making boreholes in Earth's surface which are not vertical. This is today a standard procedure in the petroleum industry. The largest horizontal extent of a well so far is approximately 12 kilometres. The trajectory of a well should be determined as exactly as possible. This is done by measuring the length of the borehole and its direction compared to the gravitation and magnetic fields at short intervals. Variations in Earth's magnetic field generated by electric currents in the ionosphere and magnetosphere are highly space weather dependent. The petroleum industry typically aims on knowing the magnetic field within 0.1 degrees in the declination, 0.05 degrees in the inclination and 50 nT in the field strength. During magnetic activity in the Polar Regions deviations in the field of several degrees in direction and hundreds of nT in field strength are often experienced. Monitoring the magnetic disturbances field and possibly correct for them are thus of considerable importance to achieve precise wellbore trajectories. The regions exposed to the effects of the polar magnetic disturbances where petroleum exploitation is performed includes the North Sea, Norwegian Sea, Barents Sea, North-West Russia and Alaska. Helps the drilling operator to discriminate between an instrument error and a natural cause when the data from the well signal an error. This helps reducing the number of costly pull-outs of the drill string. Reduces the risk of collisions between wells, an incidence that may be costly and even catastrophic. Increases the output of the reservoir by entering it from an optimal direction. Wells out of control (blow-outs) should not happen normally, but when they do happen, a relief well may be needed to stop it. Precise navigation is then critical. Magnetism is one of several properties of Earth's crust helping to understand its structure and thereby locate possible natural resources. Magnetic surveys to produce maps of the magnetic field are standard procedure when searching for mineral resources as well as oil and gas, at land as well as offshore. In the petroleum industry maps of the magnetic field are also important in order to improve well-bore navigation (see above). During an aeromagnetic survey the magnetic field strength is measured with a total field magnetometer onboard an airplane or towed under it. The survey is carried out by flying a network of parallel straight lines over the selected area. Aeromagnetic surveys are subject to disturbances in the magnetic field created by currents in the ionosphere and magnetosphere and ionospheric irregularities giving rise to uncertainties in space based positioning systems, and thus space weather is of interest for the surveying operation. To keep track of the unwanted variations and disturbances reference magnetometers is required in or near the area being surveyed. Both magnetic surveys and drilling operations, depends on accurate recording and monitoring of the position of the measuring platform and drill rig. Therefore it may be useful to combine ground based magnetometer data as discussed above with precise positioning from GNSS services (TIO services). This service page is curated by the ESC Geomagnetic Conditions. For further information, please contact SSCC Help-desk. The latter three products are grouped into the Service Supporting Resource Exploitation System Operators (RESOSS). Here targeted products are available for both drilling operations and magnetic surveying operations. For both groups real-time and historic magnetometer data are combined with real-time GNSS based products such that the user may monitor the current (real-time) conditions both related to geomagnetic field variations and position during the operation. RESOSS is available for selected locations along the Norwegian coast and around Svalbard. Available are plots and also numerical data (Real-time and historic geomagnetic activity plots and data files). The user may register for e-mail based alerts (Alerts) based on predefined thresholds. This way the user will be alerted when there is geomagnetic activity in a certain area of interest. For more details, see the description pages included in the RESOSS service. The RESOSS service does not provide forecasts. If the user needs forecasts one hour in advance, this is available through the Short term (1 hour) local geomagnetic forecast product. 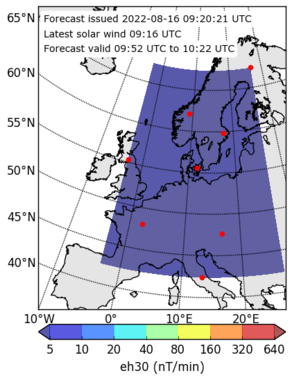 Here, the predicted geomagnetic activity for certain locations (Dombås, Tromsø and Ny-Ålesund) and certain magnetic field components (H,D,I and F) are available for the past 24 hours as well as the next ~hour. It is noted that the predictions performed in the Short term (1 hour) local geomagnetic forecast product are based on statistical relationships and cannot be considered accurate to the same extent as measured values. For true values of magnetic field variations, it is referred to the real-time products based on real measurements (Real-time and historic geomagnetic activity plots and data files). In addition to the specific products directed towards the resource exploitation companies, the products for interplanetary medium at L1 give forecasts and real-time data for solar wind properties. SWE Data is a web application that provides access to a wide range of Space Weather related data sources covering the areas of the spacecraft, ionospheric, and ground effects. SWE Data allows the user to access all data contained in the repository providing analysis and visualisation tools from these disparate sources. This section provides links to web pages or resources that are not part of the SSA Space Weather Network or esa.int domain. These sites are not under ESA control, and therefore ESA is not responsible for any of the information or links that you may find there. A geomagnetic activity forecast for improving the efficiency of aeromagnetic surveys in Greenland Watermann et al. (2011), Advances in Space Research, Volume 47, Issue 12, p. 2172-2181. Improving the Accuracy and Reliability of MWD⁄Magnetic-Wellbore-Directional Surveying in the Barents Sea Edvardsen et al. (2014), SPE Drilling & Completion, ISSN 1064-6671.s 215 - 225.s doi: 10.2118/166226-MS.